A small number of stars moving so fast they’ll eventually escape the Milky Way may not come from our galaxy at all, a new study reveals. Until now, scientists have largely believed that such hypervelocity stars originate when binary stars get torn apart by the supermassive black hole at the center of the Milky Way, which consumes one star and flings the other away at incredible speeds. There are alternative scenarios, but none explains why most of the 20 or so hypervelocity stars found so far are all in the same area of sky, in the Leo and Sextans constellations. 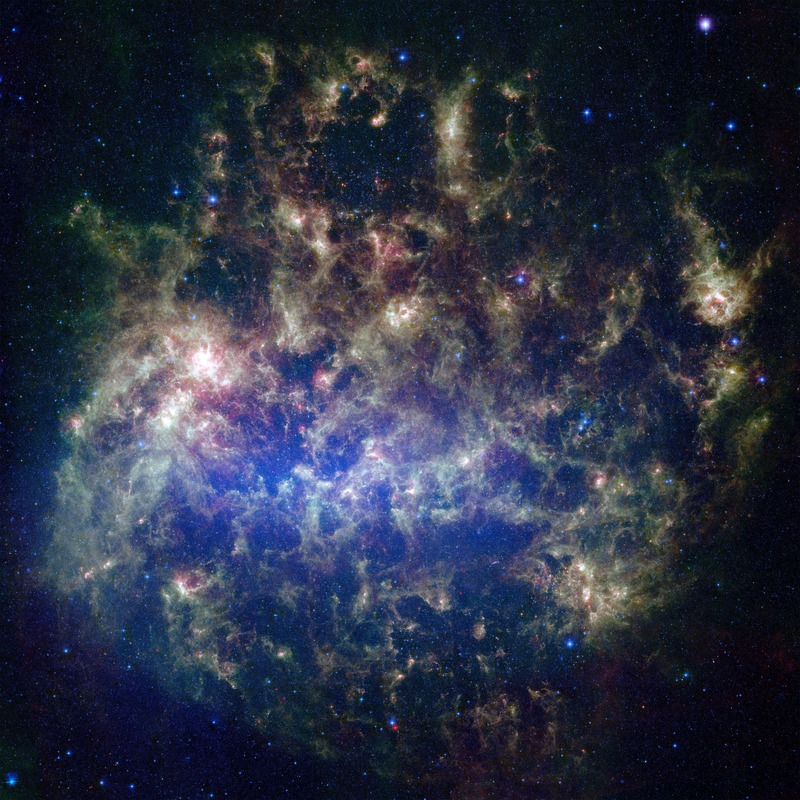 Now, a team of astronomers has used position and velocity data from the Sloan Digital Sky Survey as well as computer simulations of stellar evolution in the Large Magellanic Cloud (LMC, pictured above), a small satellite galaxy near the Milky Way, to show that these speeding stars may come from there. Lower velocity runaway stars can be produced when one half of a binary pair explodes as a supernova, blasting its partner away. Such an event in the LMC, which has 10% of the Milky Way’s mass, could easily eject it from the satellite galaxy altogether. And because the LMC is orbiting the Milky Way at nearly 400 kilometers per second, a star ejected from it could be moving faster than the 500 kilometers per second that makes it a hypervelocity star in the Milky Way. As the team report today in Monthly Notices of the Royal Astronomical Society and at the U.K. National Astronomy Meeting in Hull, most of the known hypervelocity stars have trajectories that would fit this scenario. Confirmation will hopefully come next year when Europe’s star-mapping satellite Gaia publishes its full catalog: The team predicts it should find more hypervelocity stars along the past and future orbit of the LMC. Kepler Mission –"Discovers 33 Stars Over 11 Billion Years Old With Earth-Like Planets"